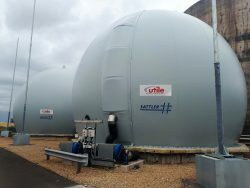 As part of the overall site refurbishment program, Nomenca have contracted Utile to design, supply and install a 1350m3 Sattler double membrane gas holder for this Wessex Water site. 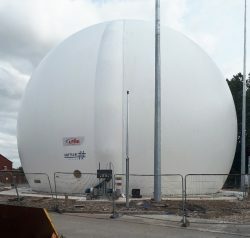 The installation is a conventional ground mount and complete with1.5kW air blowers as well as our patented inner membrane stabilisation and air distribution system. 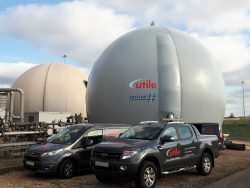 Utile have been commissioned by Smurfitt Kappa to install a 400m3 Sattler double membrane gas holder as part of the new AD facility at this Industrial paper processing plant. 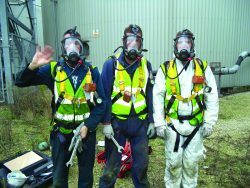 Our design incorporates 3kW air blowers operating on a duty and standby basis using automatic pressure stabilisation via our “smartdrive” control system.